Labrador Retrievers that express the dilution gene (dd) are recognized and registered by the American Kennel Club (AKC) based on their foundation genetic colors, Black, Yellow, or Chocolate. 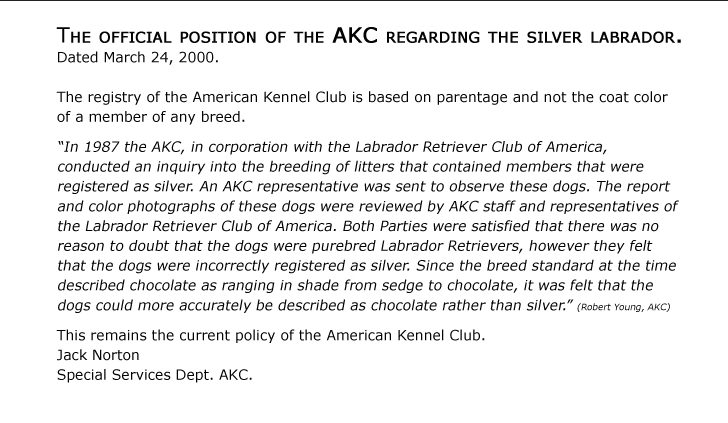 - Labradors that are descriptively called “Silver” are registered as their base genetic color Chocolate. - Labradors that are descriptively called “Charcoal” are registered as their base genetic color Black. - Labradors that are descriptively called “Champagne” are registered as their base genetic color Yellow.